Bailey Bridge Standard Bridge is the first injection molded plastic kit from Artitec. This 1/87 (HO) model is item 1870140. An extension kit is available and allows modelers to create a Bailey of a variety of lengths and load bearing factors. It is due to be released at the end of December, 2018. For your edification, I have included an engineering website look at the difference between UK & US Baileys. You can access it via Click here for additional images for this review, below. The Artitec kit consists of two parts: a basic kit, containing enough parts to build a standard light bridge, and an expansion Set that allows for heavier constructions. Multiple expansion sets can be used to to create double or even triple Bailey bridges. From short light bridges to cross a small stream to heavy bridges on pillars crossing a ravine: the sky is the limit! Col.Robert Stout: Tell our British cousins to hustle up some Bailey crap…. Lt. Colonel J.O.E. Vandeleur:When you refer to Bailey crap I take it you mean that glorious, precision-made, British-built bridge which is the envy of the civilized world? That exchange in the movie A Bridge Too Far was my introduction to the legendary Bailey bridge. An ingenious design of modular heavy engineering equipment, in World War Two soldiers said the three best-known names were Eisenhower, Montgomery and Bailey. Indeed, the Bailey bridge is still in use in hundreds of locations around the world. The system was the brainchild of Sir Donald Coleman Bailey. The English army entered the war with bridges of only 17-ton capacity. Sir Bailey created a modular portable, pre-fabricated, truss bridge design of 35-70 tons capacity that could be carried on light trucks and erected manually. Bailey bridges continue to be extensively used in civil engineering construction projects and to provide temporary crossings for foot and vehicle traffic. There is even a company in Alabama that builds Bailey bridges. The design was even used during Desert Storm, by SFOR in Yugoslavia, and even in Afghanistan. The model is packed in a end-opening box, decorated with an image of the assembled model on the front, and parts and the extension kit on the back. The parts are cleanly molded without flash, noticeable seam lines, ejector circles or sink marks. The assembled structure is 6 deck sections long with a ramp on each end, for an approximate length of 80 scale feet. Artitec put a lot of effort into this model. The cleanly molded pieces are not chunks of styrene. Holes are molded through the transoms. Fine clasp brackets are molded to the ends of the panels. Each deck panel is molded with simulated lumber on the top and stringers on the underside. Artitec guides assembly with a high-quality booklet. It is black-and-white line art supported with shaded illustrations. Three languages are used: Dutch; English; German. Twelve steps guide the assembly of the basic kit. Several more steps show how to make double and triple Baileys, as well as building Bailey piers and Bailey towers. The booklet also includes a history of the Bailey Bridge. Load capacity and configurations are presented as well. Artitec's 1/87 Bailey Bridge is their first injection molded plastic kit and it is an excellent introduction to that material. This is a model I am very excited about building. It appears to be easy to assemble. Molding is excellent. Detail is high. True to the Bailey design, Artitec's extension sets can allow modelers to create amazingly impressive structures. Being scaled to 1/87 - which is HO in model railroading - and being that Baileys were also used for railway bridges, Artitec gives us the potential for exceptional scenes - static on a diorama or animated on a railroad layout! Baileys are also used for civil infrastructure and are still being erected today. My only minor complaint is not listing UK colors for the Bailey. Artitec's Bailey Bridge is an exceptionally exciting kit for 1/87 modelers. It is valid for military and civilian scenes, from the early 1940s to today. Highly recommended! Please remember, when contacting retailers or manufacturers, to mention that you saw their products highlighted here – on Armorama. * Thanks to Paul Roberts, Past Editor Boresight, Armor Modeling and Preservation Society. Highs: Crisp molding and high detail. Excellent expansion potential. Verdict: Artitec's Bailey Bridge is an exceptionally exciting kit for 1/87 modelers. It is valid for military and civilian scenes, from the early 1940s to today. 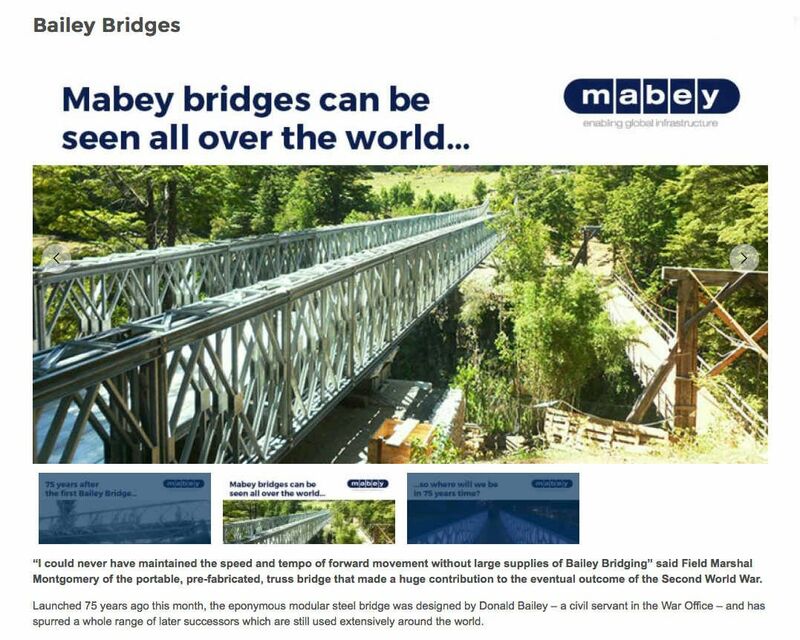 The Bailey Bridge System is still available for rent or purchase today from the Maybey Company. BTW, I think I have the extension set, if y'all would like to see it, too. This is a most interesting thread. Who knew we'd get so much enjoyment and stimulation from this kit before anyone even builds it? Here are links to an Armorama discussion on the Bronco Bailey Bridge as well as a review published by the Perth Military Modeling Site: LINK LINK LINK I find this hard to believe but with the Bronco kit it appears you have to build up each and every bridge truss panel FROM 17 INDIVIDUAL PARTS! Heck I might as well just get a pile of assorted Evergreen "L" stock, make a plan drawing to scale and build the panels myself! I post this here simply because this was news to me so perhaps others had not heard of it either. In addition to the older Bronco "double, single" Bailey bridge kit, in 1/35th, Bronco now also offers a "double, double" version. Perhaps I just need something to complain about but this double, double for me also does not fit the bill. The bridge is too short (Ascetically). 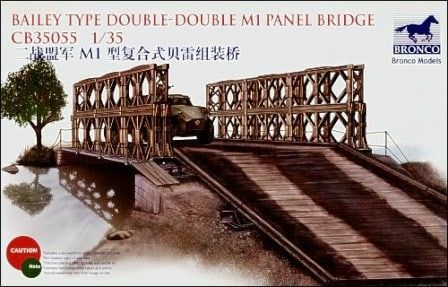 In my mind the perfect sized bridge for a diorama would be a double, single either four, five or six panels long. If I were to buy the double, double bridge kit but then build it as a double, single I would have enough bridge panels but I would still end up needing additional road deck sections and the crossbars needed to support those road sections. Hopefully the road approach sections are identical to the bridge road sections and could be utilized on the longer bridge and some additional crossbars could be scratch built. Last weekend got away from me.... Sunday hit and I had a case of "I don't wanna do anything but lounge and watch TV" I'm off till the 2nd of Jan starting Sat, so I'm sure I'll be able to get to it next week.